Today I am happy and proud to announce the launch of Money Excel Andriod App. We started Money Excel blog way back in the year 2012. Prime reason of starting this blog is to spread financial awareness & help people to achieve excellence in money management. In a short span of three years we could able to achieve this, it is all because of your constant support. I hope to receive the same in future. So many readers are approaching me and asking me to launch android app for Money Excel. Today I am ready with Mobile app of Money Excel. This app is live on google play. Money Excel app is created by keeping readability and consistent user experience in mind. 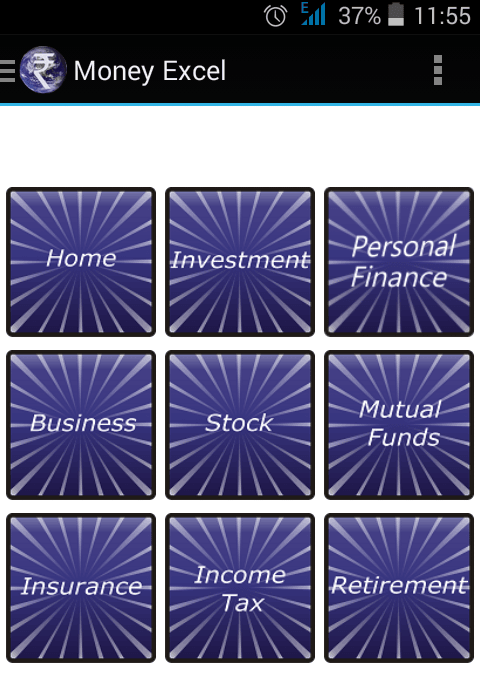 Individual category navigation is provided for investment, personal finance, business, stock, mutual funds, insurance etc. This will help you select your area of interest quickly. The Menu is quite handy at top and contains all categories and about us tab. Check the screenshot of Menu tab given below. Sharing is caring keeping that in mind sharing tab is given at the top and at the bottom. This sharing tab allows you to share content via email, facebook, SMS, Whatsapp and lot more. In the upcoming version, we will be introducing search feature and push notification features. This will help you to search post from our blog. I am still evaluating various other features for the mobile app. By the starting of July this app will be made live on Google Play. Download and Install this app to enjoy reading Money Excel blog on the move. Send me your valuable feedback and feature suggestion at info[at]moneyexcel.com & I will add most recommended features to next version of App. Share this App with others let’s help them out to learn personal finance. 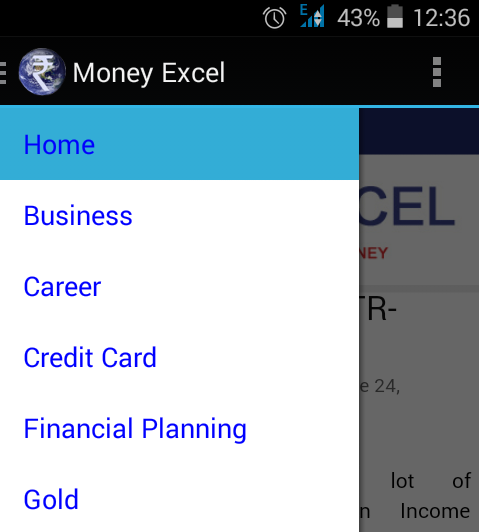 Interesting Fact- Moneyexcel is one of the few personal finance blog on the internet with android mobile app. Do share about this app with your friends on Facebook & Twitter. Hi Raviraj You are articles are awesome. Will download the app and i will share with all my friends. Thanks Akshat Do share your valuable feedback!